Demons can withstand higher temperatures than most other creatures in Idenau, so you can imagine how angry Blank is. That’s why Davis doesn’t need to use a cardboard sleeve on his cup! I guess even then he didn’t get to knock, just almost. SLICE. MOVE SLICE. YOU’LL GET HURT. I just imagine him sliding out of the panel without changing his pose at all. What devastation, Blank? The fact that Davis wanted a *gasp* LARGE? THE HORROR. Most people can’t stop staring at Floyd. He does that. If Davis got a “large”, it would be devastating on the faux-sophisticated hipster aura of this coffee shop! I want to be able to withstand hot temperatures, that way I can drink my tea as soon as I pour it, not 20 minutes later. Blank knows that to hit something accurately, you have to close your eyes while attacking. Oof, I don’t think the door is supposed to go that far. Or maybe it is, if this is a coffeehouse that has to accommodate for Blank’s patronage often. Wait a minute, I’m just now noticing that the doorknob on the other side is on the WRONG SIDE. How do you get out, unless it’s an enchanted door that opens in both directions. Gilly’s friend was not expecting this at all! She’s so surprised! Slice is the safest person here. He’s obviously an NPC, since he’s not moving, so Blank won’t attack him. Sheesh, Blank better find the red tunic soon. He’ll need something to change into while he launders his shirt. Indeed! If he had the lava tunic he wouldn’t have been affected by the Scalding. He should’ve taken home a souvenir from Molten Mountain. I feel like nobody ever says “Coffee says SCALDING all the time” etc. anymore. Which is ok with me. But I miss Rando. Wow, did Davis just do better than Skarva at fighting Blank? Davis, you devil, you. He really CAN defeat him single-handedly! Also, dang. Should have called this comic “The Fragrance of Dark Coffee”. So, now that he’s blinded by coffee, does Blank get to wear a cool cyclops mask? Sounds about wright. That would really give our comic some edge, but would it be worth it? Love the fact that Blank is the one who’s creating any devastation in that place while he said he was trying to protect it. So tempted to make a pokemon joke, but ah why not. Davis used coffee toss, it’s super effective. He’s trying to protect the world from devastation, and unite all people within his nation. Oh, and actually, “Scald” is a real move. Jeez, Slice, get your act together! I think he has it together. So together that he’s found the most adorable pose and he’s not going to break out of it ever again. …But I really am afraid his eyes are going to be stuck like that. I wonder how many places he went to before this. Weren’t there buildings on fire… and now he’s in a super calm coffee shop. It used to be calm anyway. He’s probably procrastinating on the hard stuff by taking care of the things that don’t really matter first. Just like I did in college! THOSE STAIN WILL NEVER COME OUT WHAT HAVE YOU DONE!!!!!! I totally imagined “scalding” to be read in one of those heavenly narrator voices. Narrators say “SCALDING” all the time. You call that Scorching? It’s barely SCALDING! Blank needs to Chill out, snow what I mean man? sleet the guys have an iced mocha and chillax, snow what I mean? By the Way, Ice seem to have snowed up again, it’s so n-ICE to read this again. Time for a Cold spell, there’s snow way I’m leaving anytime soon. Aww, yeah. The sky has clouded up and prepare for a blizzard, because the coolest guy around has now returned. I missed ya, buddy. “sniff, sniff” That was so sweet, I think I caught a cold, my eyes are all frosty cus they were watering and I’m snuffling. You should snow by now I’m slush a softy. I missed you too, you snow man? 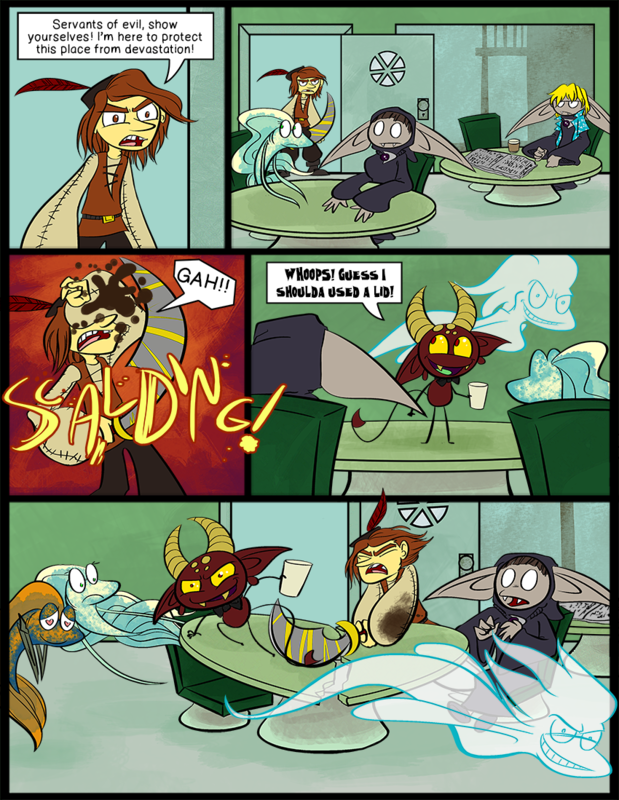 One thing I just realized about this page, Ecta and Davis are actually getting along here. Or just agreeing to annoy a common enemy. A couple pages back, they were laughing together. They can certainly get over their differences when it involves causing other people (especially Blank) problems. After all, that’s Ecta’s job and a demon’s very being.